At SMGS, we pride ourselves on recognising the ever changing demands of our student body and offer support as well as adapting our programmes in order to best prepare students for exams and to develop them into mature and responsible adults before they embark on their futures in University, their professional career or entrepreneurship. SMGS adopts a mixed ability approach and recognises the individual needs of all our students. All subjects are available to students at Higher and Ordinary Levels and banding is used in Gaeilge, English and Maths in order for students to maximise their individual ability in these particular subjects. SMGS has a number of specialised classrooms, the quantity of which will increase dramatically with the new school, equipped to the highest standard. These include rooms for: Engineering/metalwork, Woodwork/Construction studies, Art, Home Economics, Technical Graphics/DCG, Music, Computers, Ipad suites, 3 Science labs, Reading den. We are committed to the achievement of the level of academic excellence appropriate to each of our students. Students can access resource teaching providedthey have an up-to-date Educational Psychological Assessment. Science and IT development are a proud linchpin of our school and our successes in science competitions are a reflection of our commitment to science and the support of our talented teachers. Students are offered at wide range of subjects to ensure the complete spectrum of students' interests and abilities are catered for. Students may take eight examination subjects with the option of studying LCVP or PE. After the core three subjects of Gaeilge, English and Maths, students also choose four option subjects. The final option choices for Leaving Certificate reflect the personal wishes, future career aspirations, aptitudes and abilities of the students. Along with the traditional Leaving Certificate subjects, SMGS also offers the Leaving Certificate Vocational Programme (LCVP). This is a student- centred and student directed course which enhances the other option subjects by educating students about the world of work, business and entrepreneurship. English is an international language spoken or being learned by people in almost every part of the world. In Junior Certificate English you will learn how to communicate more effectively with others and to express your point of view in many different ways.You will also have many opportunities to use your imagination and to find out about great writers. By the end of the Junior Certificate course, you should be better able to understand your world and to say what you think about it. The aim of Junior Certificate Irish is to improve your ability to communicate through Irish.You will focus on improving your language skills through concentrating on four areas; your spoken language through speaking; your listening skills through listening to others, CDs and tapes; your written skills through writing in Irish, and your reading skills through reading passages, poems and stories written in Irish. All students of SMGS will also be invited to take part in the annual festivities as paart of Seachtain na Gaeilge. In Mathematics, you will develop your problem-solving skills and your ability to present logical arguments.You will be better able to use what you learned in Mathematics in real life situations in everyday life and work. History involves the study of people who lived in the past - ordinary people as well as famous people. In History class in SMGS, you will learn about the sources of evidence on which we base our understanding of their lives. You will find out about important changes that, over time, have helped to shape the world in which you live. In Geography you will study about places, people and what shapes the environment. You will learn how the environment influences people, and how they change the environment.You will develop your ability to draw and understand maps, graphs and diagrams, as well as studying photographs and collecting information outside the classroom through fieldwork with a trip organised for all first year students in SMGS. The modern languages you can learn for Junior Certificate in SMGS are French or German. Depending on your school, you can choose one or more of these subjects. In learning a modern language, you will begin to understand what you read and hear, and to talk and write in the language. In Art, Craft, Design in SMGS you will have the opportunity to create images and objects using a variety of tools, materials and special equipment. To understand Art, Craft, Design it is important to make things yourself so that you learn and understand by doing. We come across science in everyday things in the world around us, both living and non-living. Studying Science in SMGS will help you to understand the importance of science in our lives and in the environment. Opportunities are available to SMGS students also to take part in various scientific competitions including The BT Young Scientist Exhibition and Scifest. Metalwork is one of the technology subjects offered in SMGS. It is an activity-based course focusing on metal, how to work with it and how to assemble different parts. Other materials such as plastics and wood are also investigated and used in project work.You will be working with basic electronic components too. 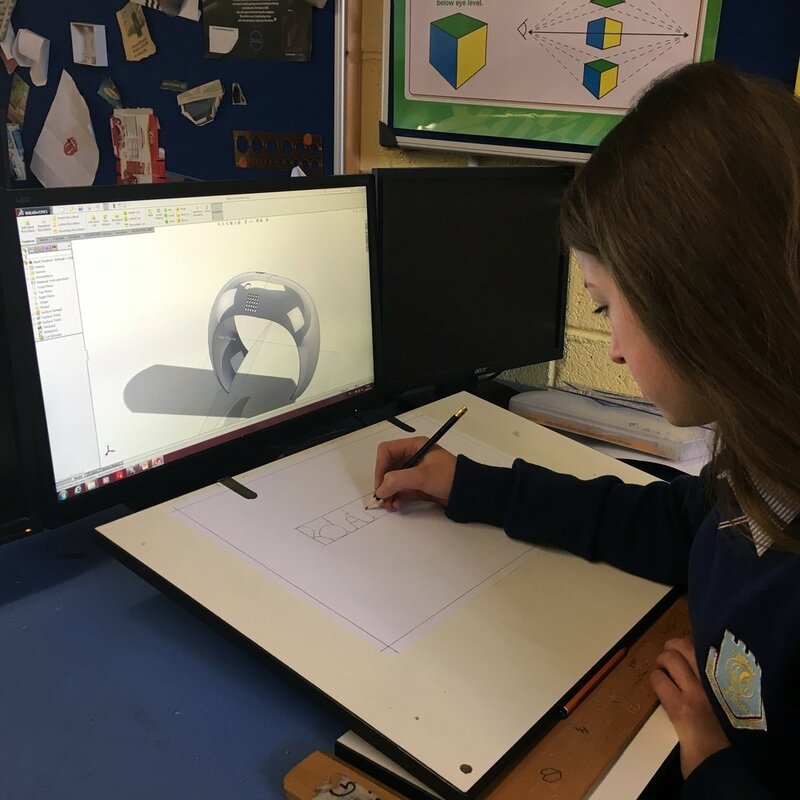 Technical Graphics is one of the technology subjects offered at junior cycle in SMGS. In Technical Graphics you will learn how to represent 3-D objects on paper and on computer.You will develop problem solving and creative thinking skills through the solution of graphical problems. Music is an important part of everyone’s life. In Junior Certificate Music, you will sing and learn how to play an instrument.You will listen to many types of music such as pop, classical and traditional Irish music and you will also start composing. Civic, Social and Political Education (CSPE) is taught to all Junior Certificate students in SMGS. It aims to help you to become actively involved in your community, your country and the wider world. Physical Education (PE) is a subject where you can take part in and learn about physical activities.You learn about how important keeping fit is for the health of your body and mind. In some activities you work on your own and in others you work with your classmates as part of a team. In Religious Education (RE) you will learn about what people believe, why they believe and how these beliefs influence their own lives, the lives of others and the world around us.You will explore how many religions, particularly Christian religions, have shaped the Ireland you live in today. In Social, Personal and Health Education (SPHE) you learn about what might help you to make choices for a confident and healthy life. In SPHE class in SMGS you will learn how to get on with your classmates better, as well as help each other to be healthy, safe and well. Leaving Certificate English invites students into rich experiences with language so that they become fluent and thoughtful users of it and more aware of its significance in their lives. It develops a range of literacy and oral skills in a variety of areas, personal, social, and cultural. Students develop a wide range of skills and concepts. These will allow them to interpret and enjoy a range of material so that they become independent learners who can operate independently in the world beyond the school.Leaving Certificate English is assessed at two levels, Ordinary and Higher level. Leaving Certificate geography may be studied at Ordinary or Higher level. The course is divided into core, elective and optional units of study. Geography is assessed at Ordinary and Higher level. Students are expected to complete a report on a geographical investigation which is conducted during a fieldwork trip at the beginning of 6th Year in SMGS and students also must sit a written examination. Leaving Certificate French and German follow a common syllabus framework for the teaching and examining of modern languages in the Leaving Certificate. The syllabus aims to develop learners’ communicative skills in the French, to develop their strategies for effective language learning and raise their awareness of cultural, social and political diversity. Biology is the study of life. Through the study of Biology in SMGS students explore the diversity of life and the inter-relationships between organisms and their environment. They become aware of the use of living organisms and their products to enhance human health and the environment. Agricultural Science is assessed at two levels, Ordinary level and Higher level, through a written examination and an assessment work undertaken during the course with a farm visit in 5th Year. Leaving Certificate religious education in SMGS promotes tolerance and mutual understanding. It is a broad course which seeks to develop the skills needed to engage in meaningful dialogue with those of other or of no religious traditions. Religious Education is not examined as a Leaving Certificate examination subject in SMGS.